White velvet cake is red velvet‘s pretty little sister. Red velvet cake has been around for ages and probably one of the most popular cake flavors of all time. But not everyone want’s to eat red food coloring or maybe they have special dietary requirements that don’t allow them to eat red food dye. Whatever the reason, options are always good. A lot of people wonder if you can just leave out the red food color and get white velvet and the answer is yes, kinda. You also need to leave out the cocoa powder. 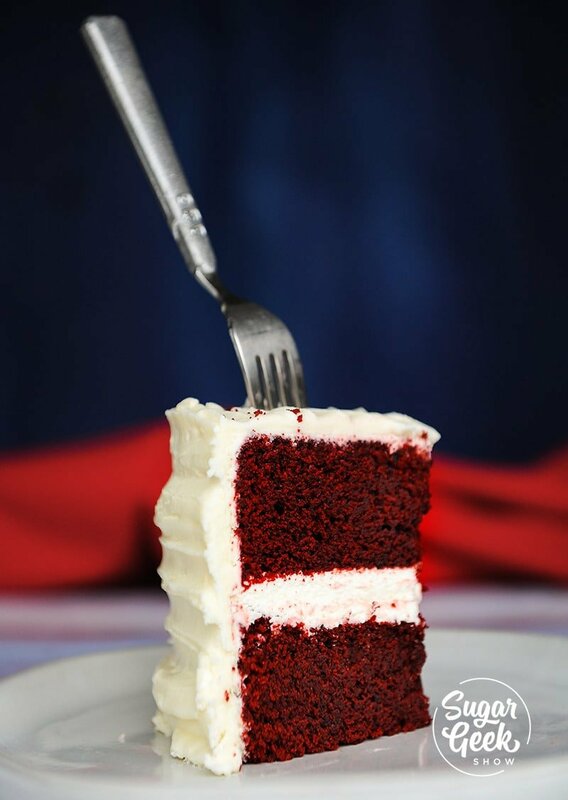 All the things that make red velvet cake delicious can be left in. sidenote… the more I spell the word “velvet” the weirder it looks… velvet. velvet VELVET. Starts to look wrong. 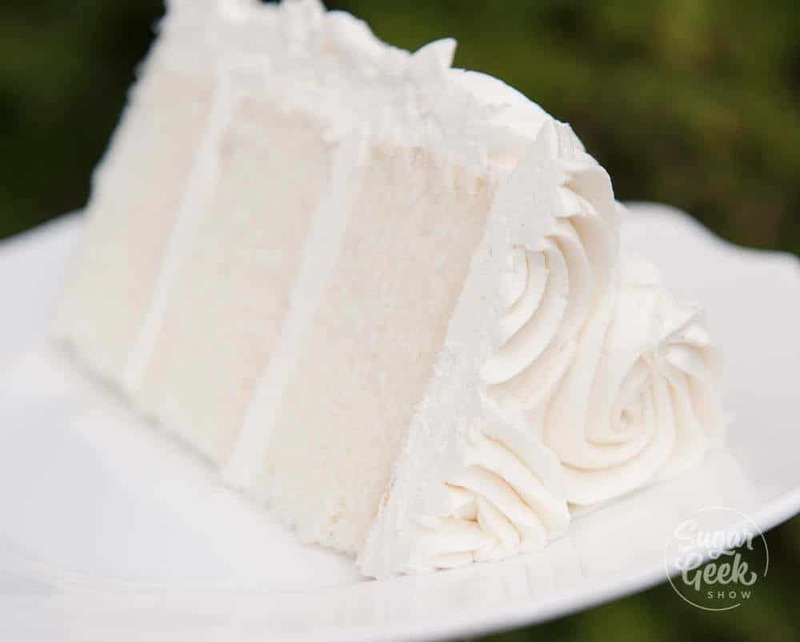 What is white velvet cake? Traditional red velvet cake has a little bit of cocoa powder in it. Some will tell you that red velvet is actually chocolate cake (wrong) or that it’s just white cake with red food color added (so wrong). The cocoa powder does add a little bit of flavor to the cake but not enough to call it chocolate so when you leave it out, it doesn’t affect the flavor that much. What’s so great about white velvet? So one of the BEST things about this recipe in my opinion is the texture. The crumb is soooo soft and well… velvety! I love how it looks when you cut it. Soft and pillowy. It’s like magic! I actually don’t know why it works. I do know however that the crumb is extremely tender. I imagine that has something to do with all that buttermilk keeping the gluten from getting too tough and making the cake turn into a brick. I mean, there’s a reason recipes like “buttermilk pancakes” and “buttermilk” biscuits always seem better than just… pancakes. Ya know? The one thing I would warn against as a professional cake decorator is this cake is VERY soft. Not sure I would suggest using this for sculpted cakes. It will stand up to stacking though. If you are going to use it, make sure it’s well chilled first. How does white velvet cake taste like? 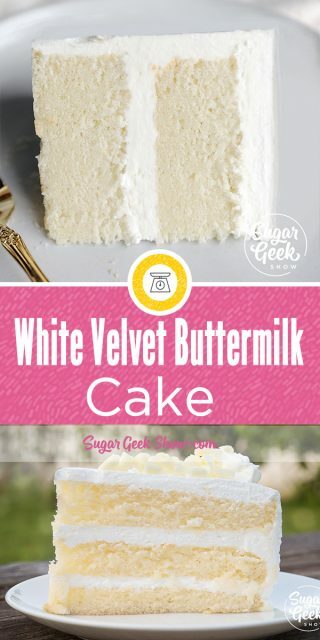 White velvet cake tastes so amazing BECAUSE of the buttermilk! It just adds a little tang and zip that for some reason your tastebuds just love. The crumb is super fine like my white cake recipe or my vanilla cake and is definitely a great cake for flavor to just bake up for a special occasion. What frosting goes with white velvet cake? The traditional frosting that goes with velvet cake is ermine frosting. Ermine frosting is made by cooking sugar with a bit of flour and then whipping it into softened butter. 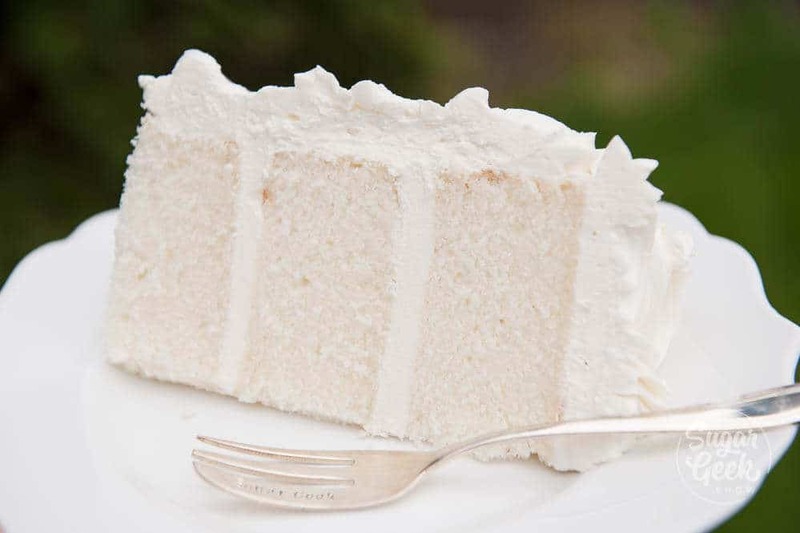 Ermine frosting is super creamy, not too sweet and tastes amazing with white velvet cake. In my opinion it tastes very similar to a swiss-meringue buttercream but without the eggs so it’s a nice alternative if you have an egg allergy. How do you make blue velvet cake? To make blue velvet cake, simply add in 1 oz of electric blue food color (for a light blue cake) or royal blue food color (for darker blue) to the base white velvet recipe. For a more natural blue, add 1-2 tsp of natural cocoa powder ( not dutched. I like Hershey’s special dark) The cocoa powder will tone down the bright blue just a little so it’s not so VIVID and make a nice natural blue. Or if you want a really bright blue you can leave the cocoa powder out. 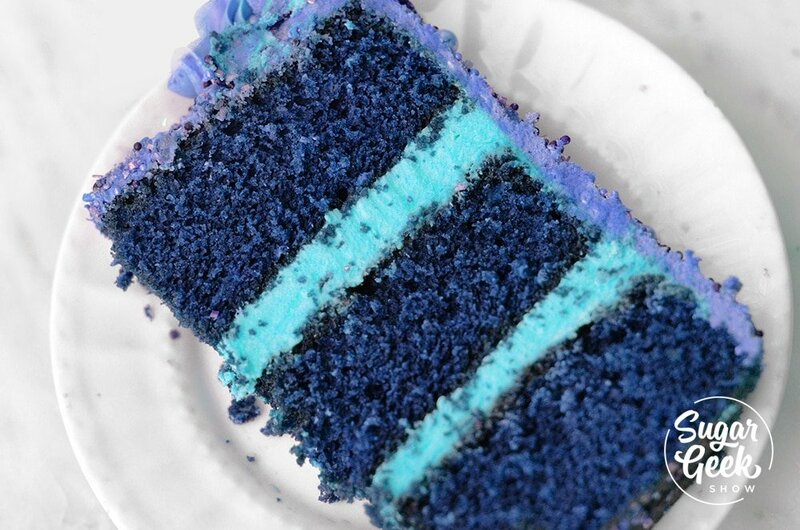 Blue velvet is a great cake for gender reveals, birthday cakes or just because blue velvet is awesome. Can you can make velvet cake with different colors? Yes! If you want a different color of velvet cake then simply replace the food color with any other color you like. You can do a velvet rainbow, ombre or go with neon. The color possibilities are endless! 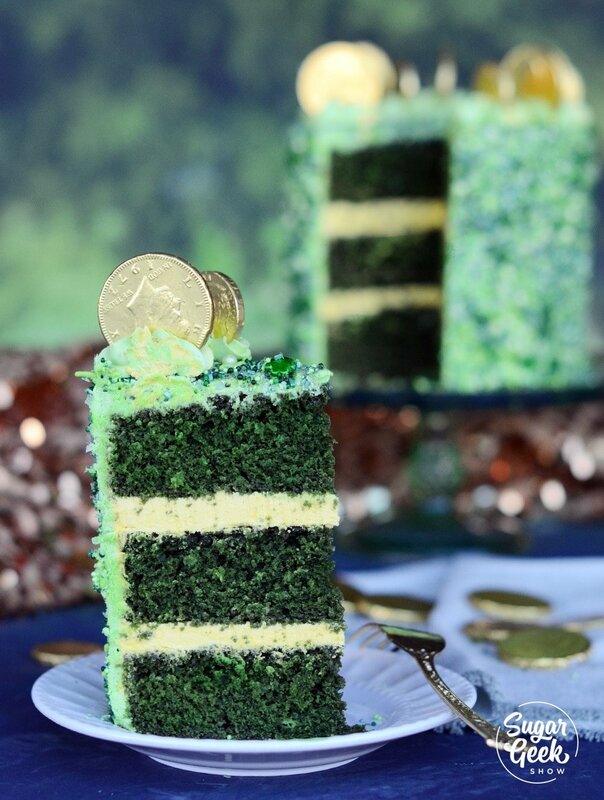 I made this lovely green velvet cake for st patricks day! I added in the cocoa powder for a more natural shade of green and used 1 oz of leaf green americolor food color gel. What about black velvet cake? Ok so TECHNICALLY I have another recipe called black velvet cake that does not use this velvet cake base. Why? Because it’s really a chocolate cake. It doesn’t have any buttermilk in it, vinegar or food coloring! So why even bother calling it black velvet? Well it’s got a nice velvet-y texture. In the future I may experiment further with a true black velvet recipe working from the base velvet recipe but upping the cocoa powder. Too many cake ideas, so little time. Bake at 335F for 30-35 minutes until a toothpick comes out cleanly. NOTE: It is SUPER IMPORTANT that all the room temperature ingredients listed above are room temperature and measured by weight so that the ingredients mix and incorporate correctly. Prepare two 8"x2" (or three 6") cake pans (with a little leftover batter) with cake goop or preferred pan spray. Fill your pans about 3/4 of the way full of batter. Combine flour, sugar, baking powder, baking soda and salt in the bowl of .a stand mixer with paddle attachment. Mix 10 seconds to combine. Combine 1/2 cup of the milk and the oil together and set aside. Combine the remaining milk, egg whites and vanilla together, whisk to break up the eggs and set aside. Add your softened butter to the dry ingredients and mix on low until mixture resembles a coarse sand (about 30 seconds). Add in your milk/oil mixture and let mix until dry ingredients are moistened and then bump up to med (setting 4 on my kitchenaid) and let mix for 2 minutes to develop the cakes structure. If you don't let your cake mix on this step your cake could collapse. Scrape your bowl and then reduce speed to low. Add in your egg white mixture in three batches, letting the batter mix for 15 seconds between additions. Scrape down the sides again to make sure everything is incorporated the pour into prepared pans. Bake 30-35 minutes until a toothpick inserted into the center comes out cleanly but the cake has not begun to shrink yet from the sides of the pan. IMMEDIATELY TAP PAN FIRMLY on countertop once to release the steam from the cake. This stops the cake from shrinking. Let cakes cool for 10 minutes inside the pan before flipping them out. The cake will shrink a bit and that is normal. Flip onto a cooling rack and let cool fully. I chill my cakes before handling or you can wrap them in plastic wrap and freeze them to trap moisture in the cake. Thaw on the countertop while still wrapped before frosting. Whisk together your flour and sugar in a medium sauce pan over medium heat. Cook for about 2 minutes to toast the flour. Slowly add in your milk, whisk to combine and bring your heat to medium-high. Whisk continuously until mixture is thickened and pudding like. Cover with plastic wrap and let cool. Add your butter to the bowl of your stand mixer and whisk on high until light and fluffy. Slowly add in your cooled flour mixture one spoon at a time as you whip. Incorporating slowly insures a smooth buttercream. Add in your vanilla and salt until everything is creamy and then you can frost your cooled cake. I loved making this recipe, it was moist and delicious. I have a recipe that I’m wanting to try for a Pina colada rum cake. It calls for a white or yellow cake mix. I don’t have a cake mix, because I never make anything but these cakes on your site. I’m wondering if I can use this recipe as my base instead of the mix. What are your thoughts on that? I tried making this and failed miserably. I think I was wrong on the flour and sugar. How many cups of AP flour is 12 oz and how many cups of granulated sugar is 14oz. Thank you! Wasted ingredients because that isn’t noted. Thanks. Actually it IS noted. In every recipe, the first step says that you must weigh the ingredients. That’s a bit harsh mate. No need for the tantrum because you didn’t read that you have to weigh your ingredients. Hi there, could I use yoghurt instead of buttermilk in this recipe? Yes definitely… I always use half milk, half Greek yoghurt instead of the stated amount of buttermilk and the result is always brilliant. THANK YOU for scaling your ingredients!! Using a scale is not only best for accuracy, but it saves a lot of time and utensils in the kitchen. I can’t live without my scale! I made this cake and everyone loved it. I appreciated the subtle mix of sweet and tang. I will, however, have to turn down the temp on my oven because the edges got a bit crispy. Great for home snacking (I looove the crispy bits), but not so great if I’m cooking it for someone else. How many cups of batter does the recipe version for 2-8″ rounds make? I’m looking for at least 6 cups batter. Should I go with 2 rounds or 3? Thanks! 6 cups of batter, I use 2″ tall cake pans. Maybe your oven is a little hot or the cake was too close to the top of the oven? I do always have browning on my cakes but I trim the brown parts off (top, bottom and sides) before torting and frosting. Would I do the white velvet recipe to do a yellow velvet cake and just add yellow food coloring? I love this cake, the first time I made it I failed somewhere but tried it again and voila!! Lol. I am going to try this cake adding in pistachios next time, my husband wants pistachios in a cake, how do you think that would taste? why the vinegar? can I leave it out? Hi! I am excited to try this recipe…I have been reading through all of the notes here. I notice the comment here for the vinegar, which I used in red velvet cake, but I didnt see it in the ingredients list here. Did I over look it or is it not needed for the white velvet cake. I just want to be sure before I delve in. 🙂 Thanks so much!! So glad that was asked and answered. Whew! Do the eggs and buttermilk need to be room temp? Can I use carton egg whites? Did you leave out the cocoa to achieve the purple color or adjust the amount of cocoa? Does this recipe do well as cupcakes? I’ve learned the hard way not every cake recipe works well as cupcakes. Ina Garten’s Beatty’s Chocolate Cake is one. I would give ANYTHING to use it for cupcakes but every time I’ve tried its been a complete disaster. It bakes out over the cupcake pans, its a mess. I was so shocked the first time I tried it I didn’t know what to do. And shockingly, the very same thing happened when I used it to bake in a Wilton shaped cake pan. I only fill about half or a hair above full and it bakes out all over the oven. But yet, when I do it in round cake pans, it’s beautiful. Go figure. It makes NO sense to me at all. My mother made red velvet cake for my birthday every year when I was growing up! The white sounds divine! But she made an ermine frosting. I never see that anymore. Rich without being too sweet. Hello, just checking that the oil & buttermilk measurement their weight and not fluid ounces? Have you had a chance to try this or any of your “velvet” cakes as cupcakes? I need a good white cupcake and immediately thought of this recipe. When I wrote before you mentioned you were going to try cupcakes. Have you tried any yet? 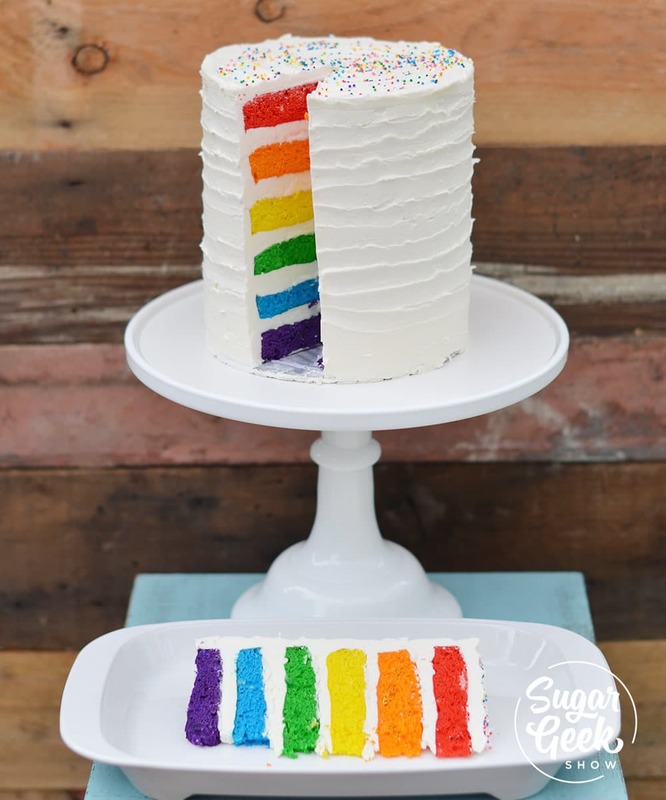 If this recipe calls for 2- 8″round pans then why does the picture show a three-layer cake? Hello, I’m also interested in knowing if this velvet cake recipe will work for cupcakes. Hello, I use olive oil for much of my cooking. Will this work in this velvet cake recipe? You can but just keep in mind that olive oil has a flavor that will affect the cake. Grapeseed oil is a great option because it doesn’t have a flavor. Hi do you use the same recipe above for the blue velvet cake but just add blue food colouring and cocoa powder ? Hi! I’m planning to use this recipe for my daughter’s birthday. Can it be made the night before? Do you suggest leaving it at room temp or refrigerating if so? Thanks so much! Hi. Just wondering if this cake is robust enough to stand up to a fondant icing and decorations or is it too fluffy and likely to collapse? Can I make this cake ahead of time and freeze it? If so…for how long? Totally! Freezing seals in moisture for cakes. Just wrap in plastic wrap, freeze and when you’re ready to use them defrost on the countertop while still wrapped. If you stack while still slightly cold, that’s best. I have noticed that the recipe has changed recently. Will this new version be robust enough to be carved in the shape of a house and decorated with fondant. I am looking forward to making this for my best friends birthday cake. Yes it has been updated to be more like my other cake recipes that use the reverse creaming method. I wouldn’t use this cake to carve since it is extremely tender. 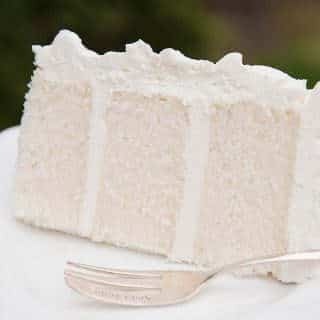 You could use the white cake recipe for carving though and replace the milk with buttermilk and add in 1/2 tsp baking soda to get a similar cake recipe. Hi! I noticed the description mentions a tang from buttermilk & a touch of vinegar. I don’t notice vinegar in the recipe ingredients. I feel like I read it 100x, but I don’t see it listed. Did I misunderstand? Is vinegar supposed to be an ingredient? —cake looks delish btw! All measurements are always by weight for accuracy. If you use cups then the recipe has the potential to not turn out and then you waste expensive ingredients. Could you please let me know the measurement for AP flour instead of the cake flour? Will it work with AP flour? what is the frosting on the cake? Does this cake freeze well for later use? Hi, I have some question. Do egg whites with buttemilk need to be whipped or mixed? I used the K whisk to mix the dry ingredients and the “Spider” whisk for the rest. I did well? the cake is rather yellow. it did not come as white as in the picture. why? THANK YOU VERY MUCH!!!!! Wish I could show you a pic of it! Thank you for the recipe!!! Can i use 3 6 inch pans instead of 2 8 inch pans? How long would i bake it for? How much food coloring to make pastel pink? Yes you can, I often do this. I would use just a drop of electric pink food coloring and start with 30 minutes and see where you are. They didn’t pull away from the liners! Woohoo! For all the colors, once the cocoa powder and red coloring has been eliminated, is it just a matter of adding the desired color to White Velvet Cake or do some of the colors have cocoa powder in them or another formula? Hi! To make the three layer cake, did you split the batter into 3 8inch pans? or 3 6inch pans? Could this cake be covered with fondant? I don’t understand the question, did you follow the recipe and use the ingredients listed? You should have used cake flour. Just made the batter for this cake, in the oven now, smells delicious, rising perfectly. The raw batter was absolutely delicious (yes, I tasted the raw batter). Will make your crusting cream cheese frosting to go with it. Cannot wait to try the finished product! Seems pretty clear to me. Baking is a science… Will make this soon! Hi Liz! 👋🏻 I see that you replied to someone above (earlier on) saying that you were planning on trying the white velvet with cupcakes. Just wondering if you ever did and if they turned out as perfect? 😊. Thinking of making some for New Years Eve. Do you have any adjustments for high altitude (over 5,000′)? I find cakes made from scratch generally need some adjustments to turn out right. How do I adapt this recipe to make/bake at 5000 feet altitude? This sounds delicious and anxious to make it. If I used whole eggs instead of egg whites what happens? Also if I cut the recipe in half how many eggs would I use? If it requires egg whites did you say carton ones can be used? Thanks for posting this! If you used whole egg it wouldn’t be white and would have a little more egg in it since you’d have to account for the addition of the yolk. One egg white weighs 1 oz and an egg yolk weighs about .67 oz so for every two egg yolks you’d subtract one egg white. I do use egg whites from a box and as long as you shake the box before you use them and don’t use egg whites that are really old then they will be good! If I have a Betty Crocker measure cup with oz on it can I use that. And I thought I read some where on Pinterest that if I didn’t have cake flour I could take all purp and sift it several times So what is the difference? Would one be able to add a type of nut to this recipe and have it hold up? For instance, can I mix in some pecans or pistachio? Which Frosting is recommended for this cake? Should I use buttercream or whipped cream frosting or Cream cheese?? I am so looking forward to making this my cat loves egg yolks (the whites are not good for them, but the yolks are) and there is only so many meringues that you can make, ha ha so pleased to find a recipe for the egg whites. I live in the UK and have never seen cake flour in the supermarkets. Is there an alternative I could use? I have a family member requesting 4 tiers of white velvet cake for their wedding. Its a delicious cake, but I’m worried if it will hold up. My doweling and supports are really strong, so I’m guessing it would hold up. Yes? I see you answered that it will hold up under fondant, but now I’m wondering if it will stack well in tiers. Thank you! Yes it can be used for a wedding cake. Will this cake hold up for a wedding cake that will have a layer of buttercream and a layer of fondant? Made this into cupcakes last night with white chocolate buttercream. They’re perfection. We even layered them to be rainbow cupcake. I wish I could post a photo! Can you use two 9” pans instead? Hello, can use this recipe for blue velvit cake, how much baby blue I can use. Thanks. This is the best white cake I’ve ever baked. The texture was nice and the cake was moist. I followed the directions exactly as they were written and it was perfect. I put strawberry jam in between the layers and on top then frosted with cream cheese frosting. It was delicious. I will be making this again!!! Super soft crumb, best white cake. Frosted with Ermine frosting, perfect. Just a quick question. This cake has become on of my favorites. I need to make a 1/2 sheet with it. Do you recommend 1 1/2 recipes or 2? Trying to make sure I have enough ingredients! Thanks! And like always, everything I make from this site is amazing! This cake is delicious! I recently made it for daughter’s first birthday. The only issue I had was after baking and cooling in the pans the cakes pulled away from the sides and angled in 🤷🏻‍♀️ Did I do something wrong? Self rising flour is not the same as cake flour. It’s just flour with baking soda and baking powder in it already and should not be used as a replacement for cake flour. Hi, will you be able to convert the ingredient measurements from OZ to grams and millilitres for the oil and buttermilk. I want to try the recipe but I don’t have an idea about measurement in oz. If you would like grams there are plenty of online converters for you to use. Thank you. Hi, escuse me, who can i make the buttermilk?? In mexico we dont use baked whit it. So its hard to tey to understand the recipe. You can make buttermilk by adding 1 Tbsp of white vinegar to 1 cup of whole milk, stir and let it sit for 5 minutes. Is it okay if i use just one 8” cake pan for this recipe? How to separate the batter if my pans are 8 x 1 1/2? Please I need this Saturday. You knocked it out of the park again!!!! Truly a delicious recipe!!! Thanks for your hard work and dedication for all of us bakers! Has anyone tried measuring the eggs by weight. I have been told the eggs I get in my country may not classify as large eggs :). Please let me know if anyone can get me a weight measurement of egg. One whole egg measures 46gm for me. Yes I usually use boxed egg whites. One egg white weighs 1oz. Best cake I have ever made! Followed directions to the letter. Tips were really helpful and informative. Thank you for sharing this recipe. P.S. I also made your cream cheese frosting and that was unbelievable as well! thank you for your recipe. i tried making this but i failed😞. i followed the recipe but for some reason it came out very oily. not sure what i did wrong. the cake was too moist and oily. it tasted good but it didn’t came out as in the picture. Sounds like you didn’t measure correctly somewhere along the way. The recipe has been made by myself and many others many many times and is not oily. Try going back over the recipe and comparing the weights to what you remember measuring to see where you might have gone wrong. Perhaps you put in too much butter. I’m wondering if this beautiful cake could be made with gluten free flour as in a 1:1 same as regular flour? Is there such a thing as gluten free cake flour? Also is there a good frosting recipe that’s not really sweet, but fluffy? Thank You for such great cakes!! Sounds delicious! Will this be enough batter for a 9×13 Pan? Any suggestions on baking time? I had never used the reverse mix method, but use again. Weighing the ingredients and READING the instructions is definitely the key to the success of this truly amazing cake. Made it this weekend for March family birthday get together and had rave reviews. This will become a favorite in my recipes to make again and again. I am a retired home economics teacher and taught Food Science and wish I had known this technique to have taught my students, mainly for weighing ingredients for baking success. Thanks again for this beautiful recipe. I have only made this recipe using oil, it might not be as soft and moist if you omit the oil. Hey there. First, this cake is DELICIOUS. So fluffy and delicate. Second, my questions: 1) it did shrink quite a bit when I took it out of the oven. Probably ended up being about half the size it was initially. Is that normal? It still seems very light and fluffy so just wanted to check. 2) I am making my first sphere cake (BB-8 from Star Wars) and just used my best judgement on baking time, leaving the temp as you suggested at 335. Do you think I should have made other adjustments? It took a long time to cook, for a 6″ diameter sphere. Probably double your suggestion above. Probably also was related to the problem in #1. Any thoughts on how I could have done things differently? Again, thanks for a delicious recipe! Looking forward to your reply because I will*certainly* make this again and hope to do a better job! Did you tap the cake pan to release air when removing it from the oven as stated in the instructions to prevent shrinking? Can you bake this like a pound cake in a tube pan? Is so, I am wondering what the cook time would be? My pound cakes bake at 325 for 1 hr and 15 minutes. I may try it sometime, but any advice is appreciated. This is not a pound cake, it is a light and fluffy dessert style cake and it may not hold it’s shape in a tube pan.